Dennis Miller Bunker (1861–1890), Wild Asters (1889), oil on canvas, 64.1 x 76.8 cm, Private collection. Wikimedia Commons. Several of the American Impressionists are now little-known, but Dennis Miller Bunker (1861-1890), one of the most promising of all, is now almost completely forgotten. Few of his paintings are in major public collections, and the last good book about him was published nearly twenty-five years ago. Bunker was born in New York City in 1861, and started his training in art at the age of only fifteen, when he enrolled at the Art Students League and the National Academy of Design. Within a very few years his paintings were being accepted for annual exhibitions of the National Academy. Dennis Miller Bunker (1861–1890), The Fisher Girl, Nantucket (1881), oil on canvas, 23.5 x 31.8 cm, Private collection. Image by Rlbberlin, via Wikimedia Commons. 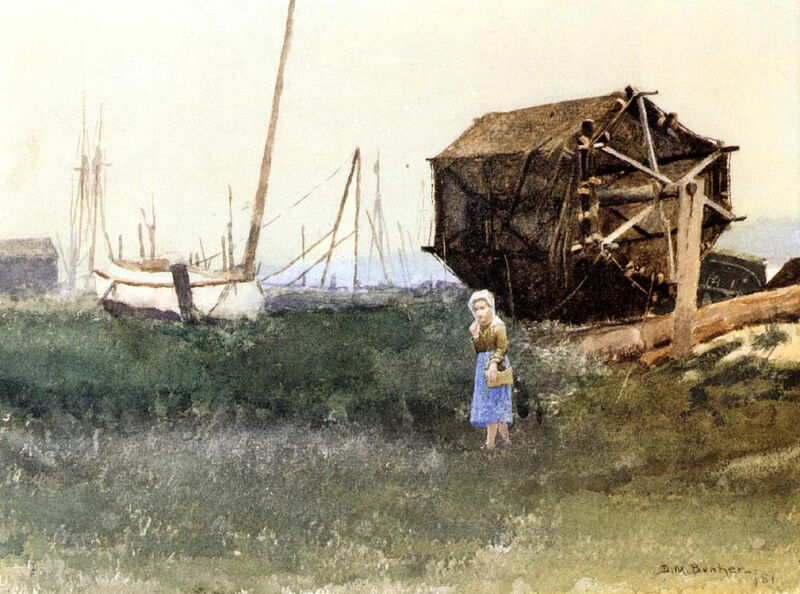 The Fisher Girl, Nantucket (1881) is clearly an early painting, in which the figure has the appearance of a collage, and is not well-proportioned. Although claimed to be in oils, this painting looks like a watercolour, and many of Bunker’s early works were in watercolour. Dennis Miller Bunker (1861–1890), Portrait of a Woman (date not known), oil on canvas, 76.8 × 63.5 cm, location not known. Wikimedia Commons. Portrait of a Woman is an undated but most probably early portrait of an unknown woman, which shows Bunker’s developing modelling of the figure, and his ability to show subtle insight. In 1882, Bunker travelled to Paris, where he studied at the École Nationale Supérieure des Beaux-Arts (better-known as the École des Beaux-Arts) under Jean-Léon Gérôme. With two fellow students, Bunker painted in northern France and the Normandy coast during the summer of 1883. The following year the trio travelled in Brittany, where some of Bunker’s best early landscapes were painted. Dennis Miller Bunker (1861–1890), Brittany Town Morning, Larmor (1884), oil, dimensions not known, The Art Institute of Chicago, Chicago, IL. Wikimedia Commons. 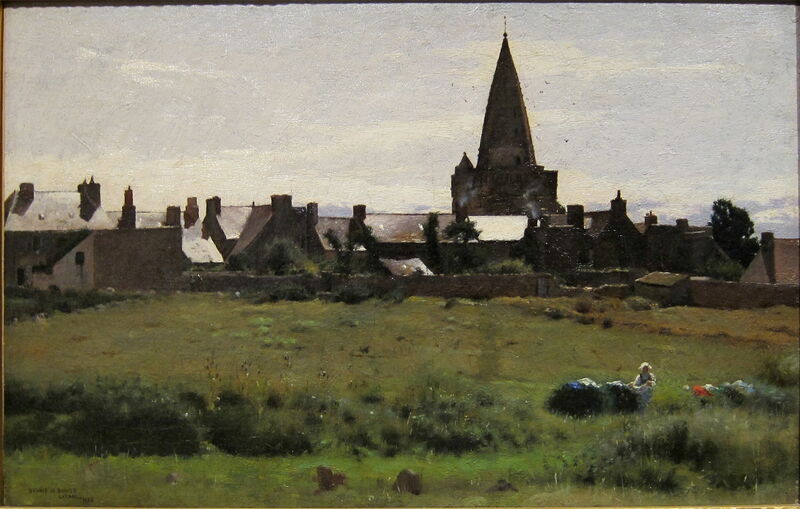 Brittany Town Morning, Larmor (1884) shows a view of the town of Larmor, on the south coast of the Breton peninsula, not far from the area in which Jules Breton was active at the time. Most probably painted largely en plein air, the careful detail in the buildings must have taken several sessions, but there are signs of sketchiness in the sky and the foreground field. The brilliant highlights of the woman with her washing (I think) in the right foreground are particularly effective, as are the delicate wisps of smoke against the church tower. Dennis Miller Bunker (1861–1890), Larmor (1884), oil on canvas, 45.7 × 64.8 cm, Private collection. Image by Rlbberlin, via Wikimedia Commons. 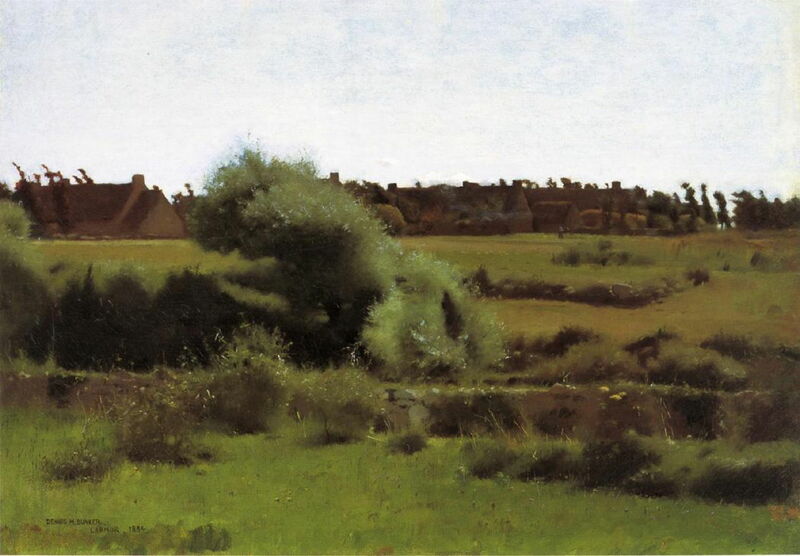 This view of the town of Larmor (1884) emphasises Bunker’s distinctive early approach to painting vegetation, with small bright details laid over more diffuse forms of bushes and plants. Bunker was back in New York City by the start of 1885, and later that year was elected to the Society of American Artists. With the support of James Carroll Beckwith, he then moved to Boston to teach at the Cowles Art School. The following year, Bunker painted in South Woodstock, Connecticut, and met Isabella Stewart Gardner, who became his patron. 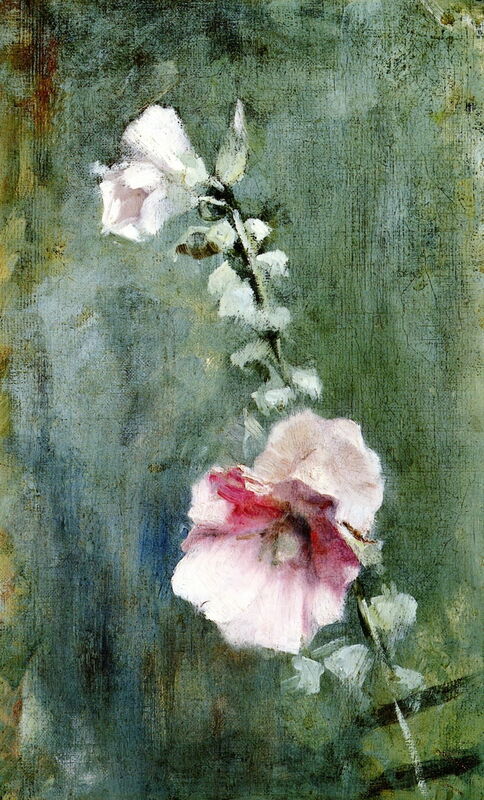 Dennis Miller Bunker (1861–1890), Hollyhock (c 1886), oil on canvas on board, 32.7 x 20 cm, Private collection. The Athenaeum. Bunker painted this single stem of Hollyhock, in about 1886, with a remarkable looseness, the smaller buds being indicated very gesturally. 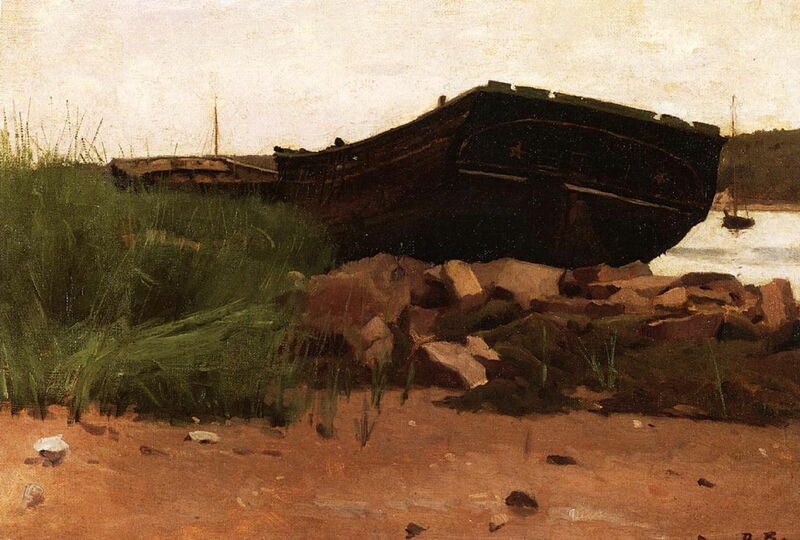 Dennis Miller Bunker (1861–1890), Old Hulks (c 1887), oil on canvas, 35.6 x 52.1 cm, Private collection. Image by Rlbberlin, via Wikimedia Commons. Bunker also painted several views of boats in various stages of decay around the East Coast, including Old Hulks in about 1887. During the late 1880s, Bunker made his living from painting the portraits of wealthy and important Bostonians, but he made his art when painting in the countryside. He first met John Singer Sargent in Boston in November 1887, and they became good friends. 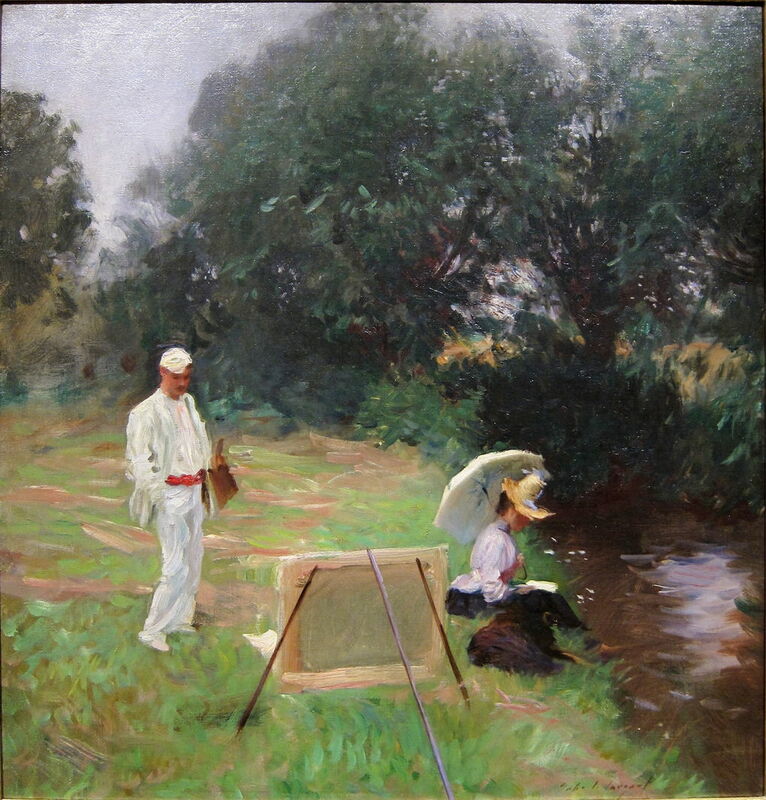 In the summer of the following year, Bunker stayed with Sargent in Calcot, England, although none of Bunker’s surviving paintings appears to have been made during that visit. John Singer Sargent (1856–1925), Dennis Miller Bunker Painting at Calcot (1888), oil on canvas mounted on masonite, 68.6 x 64.1 cm, Terra Museum of American Art, Chicago, IL. Wikimedia Commons. I have already shown John Singer Sargent’s painting of Bunker at work during the summer of 1888. Dennis Miller Bunker (1861–1890), In the Greenhouse (1888), oil on canvas, dimensions not known, Amon Carter Museum, Fort Worth, TX. Wikimedia Commons. At about this time, Bunker’s brushstrokes appear to have become more prominent, and to organise when forming flowers and vegetation. This is quite striking in his In the Greenhouse (above) and Chrysanthemums (below), both from 1888. Comparing these two works, that above appears to have been a quick sketch which he later developed in the studio into that below. Dennis Miller Bunker (1861–1890), Chrysanthemums (1888), oil on canvas, 90.2 x 121.9 cm, Isabella Stewart Gardner Museum, Boston, MA. The Athenaeum. Early in 1889, Bunker resigned from teaching at the Cowles Art School, and met his future wife for the first time. During the summer, he lodged in Medfield, MA, where he painted many of his finest landscapes. 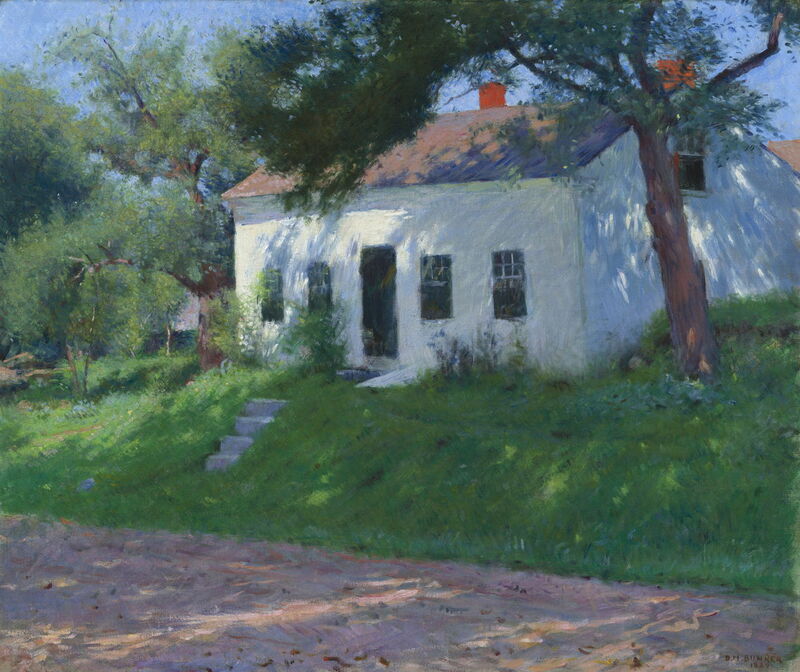 Dennis Miller Bunker (1861–1890), Roadside Cottage (1889), oil on canvas, 63.7 x 76.2 cm, The National Gallery of Art (Gift of Raymond J. and Margaret Horowitz), Washington, DC. Courtesy of The National Gallery of Art. Roadside Cottage (1889) shows Bunker at peak Impressionism, with its high-chroma colours and textures built from brushstrokes. The trees are carefully constructed from anatomical principles, though, and the picture space is traditional, reflecting his classical training. 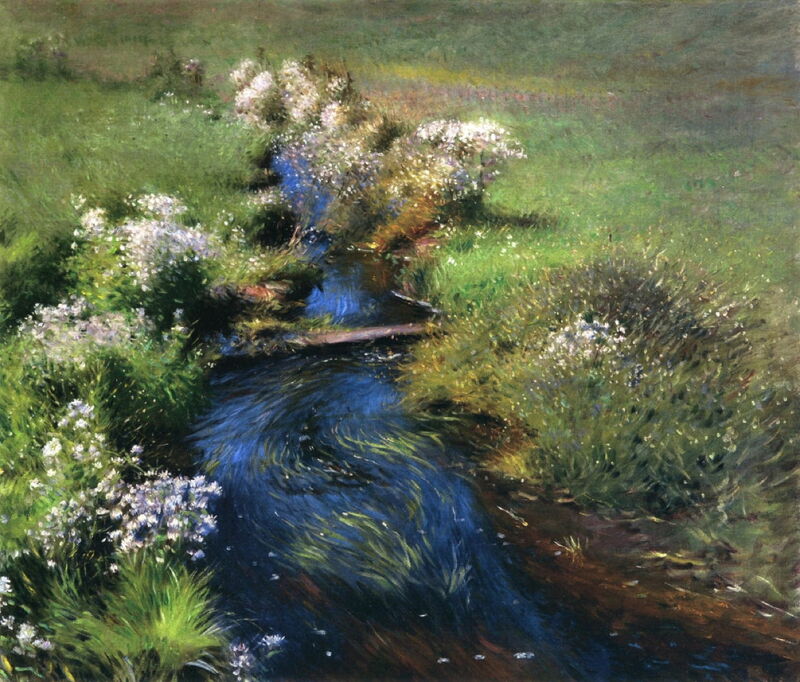 Dennis Miller Bunker (1861–1890), The Brook at Medfield (1889), oil on canvas, dimensions not known, Isabella Stewart Gardner Museum, Boston, MA. Wikimedia Commons. 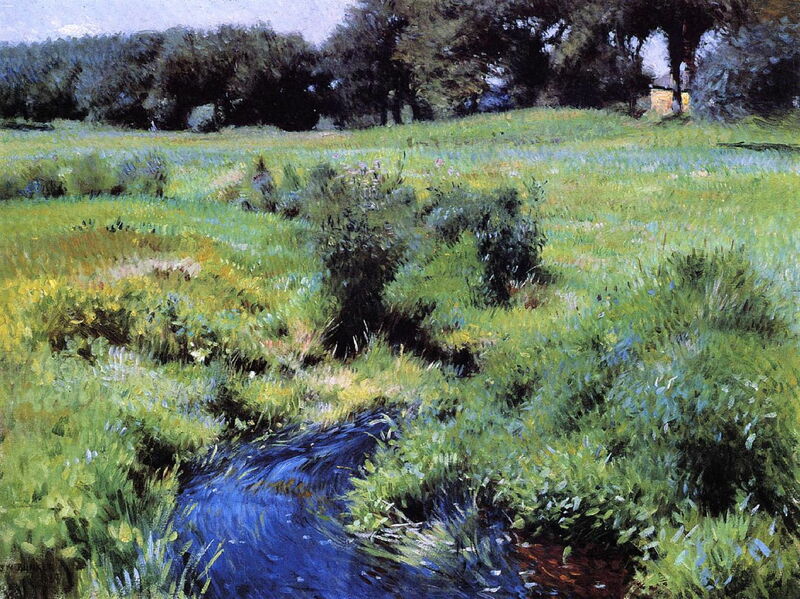 The Brook at Medfield (1889) is perhaps one of Bunker’s finest and most vivid landscape paintings. Its vegetation has emerged from his earlier diffuse and vague masses, with fine formed brushstrokes building richly-varied textures. In places these become sharply defined, and contrast with the deep blues of water. A few small patches of red, such as the small butterfly at the lower edge, add carefully controlled contrasts. Dennis Miller Bunker (1861–1890), The Pool, Medfield (1889), oil on canvas, 46.7 × 61.6 cm, Museum of Fine Arts Boston, Boston, MA. Wikimedia Commons. The Pool, Medfield (1889) is remarkable for its even greater organisation in brushstrokes, which swirl with the flowing water in the foreground, and coordinate into the stands of thistles and other wild plants. Wild Asters (1889) is another brilliant assembly of different types of mark, from the sinuous curves in the stream to the fine blotches of the aster flowers. By 1890, Bunker was a rising star in the East Coast art scene, and rapidly becoming America’s most prominent Impressionist. He was invited to teach at the Metropolitan Museum of Art, and hoped to take over William Merritt Chase’s teaching in Brooklyn later that year. He spent the summer painting in Cornish, NH, and in Medfield again, before marrying in October. 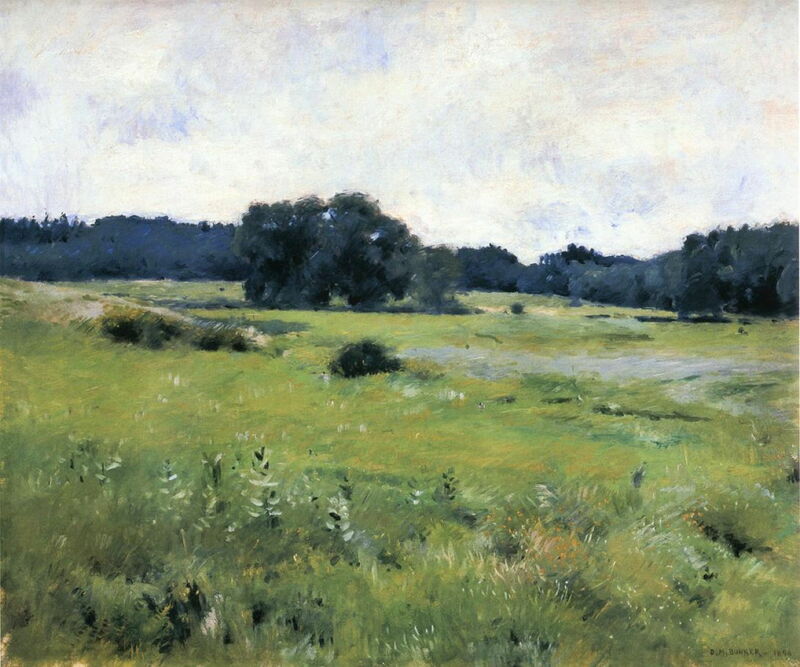 Dennis Miller Bunker (1861–1890), Marshland, Medfield (1890), oil on canvas, 45.7 x 60.3 cm, Private collection. Image by Rlbberlin, via Wikimedia Commons. Marshland, Medfield (1890, above) appears to have been a more rapid sketch of a similar mixture of water, reeds, meadow, and distant trees as in the previous summer at this location. 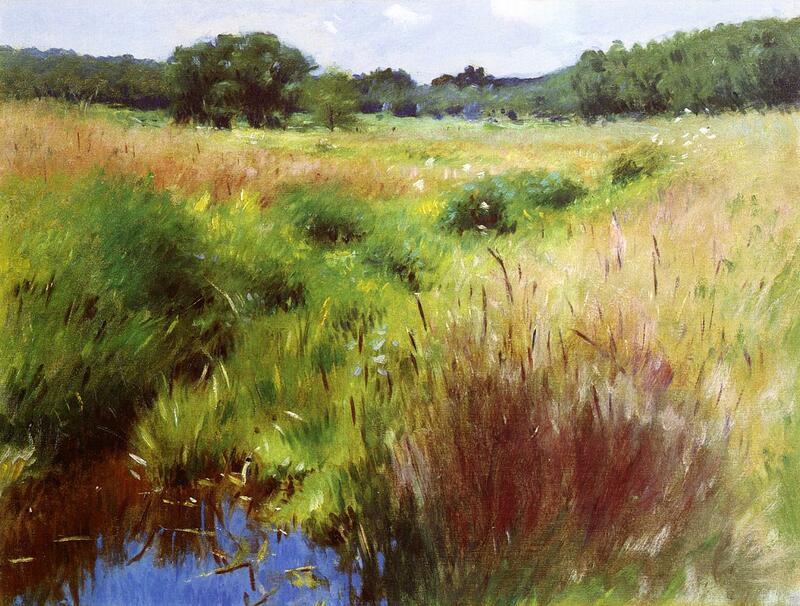 Meadow Lands (1890, below) is a similar quick study, probably painted en plein air. 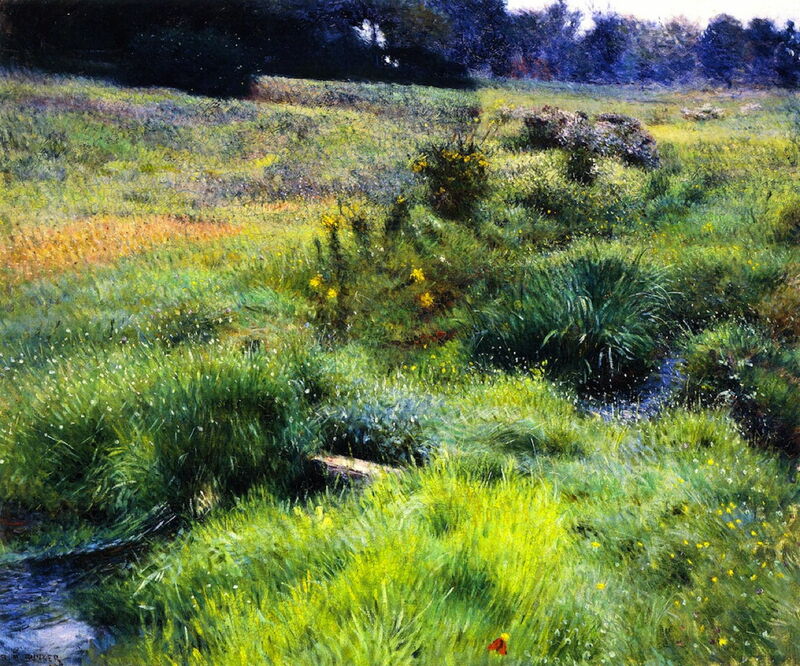 Dennis Miller Bunker (1861–1890), Meadow Lands (1890), oil on canvas, 63.5 x 76.2 cm, Museum of Fine Arts Boston, Boston, MA. Wikimedia Commons. When Bunker returned to Boston for Christmas with his wife’s family, he fell ill, and died of meningitis on 28 December 1890, at the age of only 29. By the early twentieth century, American art had moved on, and Bunker’s brief but brilliant career was forgotten. Later in the century it was re-appraised, and arguments raged over whether he was progressive or traditional. I think that contention is bogus: his work stands with the best of its period in North America, and surely deserves better recognition. Wikipedia – a good, detailed account. 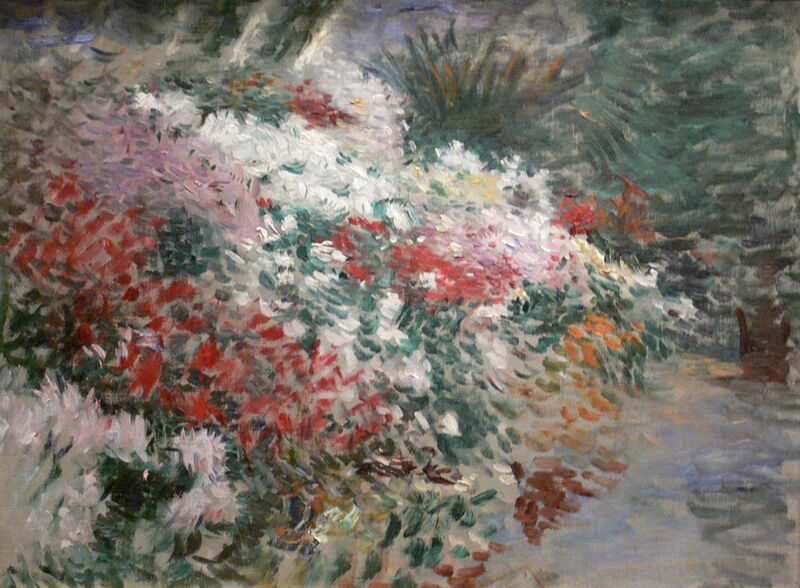 Posted in General, Painting and tagged Beckwith, Breton, Bunker, Chase, Impressionism, painting, Sargent. Bookmark the permalink. Marvelous! The way you wind us through his life like the small fishing brooks meandering through the meadow….and the bright spots of his encounters and opportunities….abruptly dropped the way his brief life ended. My heart is broken. But also blessed; this your birthday present to me. Thank you – and a very happy birthday to you! I have a question or three: In the few articles of yours that I have read concerning painters, you assess their work in light of the art movement of their time. Would you say more about the importance of one’s art being true to the movement in which one lives…one’s talent with respect to the talents of other artists of that period. How important is adherence to the style of the period? And what would be the style of the period in which we currently live? And more philosophical…is it only possible to determine the style of a period by looking back at it, once the period has ‘ended,’ so to speak? As you said, art changed after the turn of the century. Or is the style of a period determined and influenced by the ‘superior’ teaching institutions and teachers? There are several contexts which are important: the context of the artist’s own development (which is why I try to show their work in time sequence), the contemporary context of what else was going on (with the exception perhaps of Richard Dadd, few work in isolation), and with the wisdom of hindsight looking at a given era or movement. I don’t think that any is more important than another, but there is a tendency now to ignore the first two and look at everything with ‘modern’ eyes, which I think is very unfair. 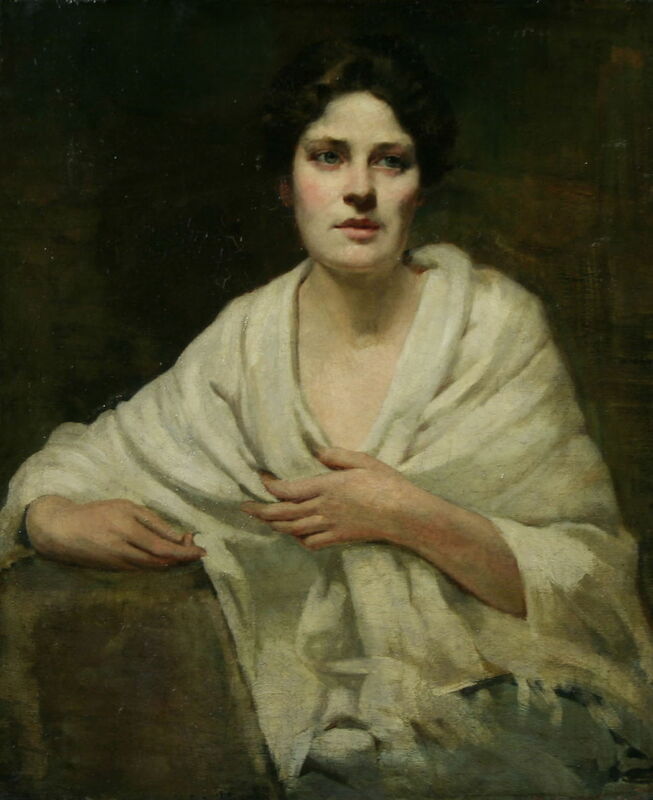 Many of the less well-known painters today were very well-known and highly rated at the time, but suffered badly in the early 20th century when painting in particularly went modernist. Sadly, although most people enjoy pre-modernist art (often more than modernist), that huge upheaval in art has left us with many problems today, where we are not ‘allowed’ to know about artists because of what happened a century ago. I also get the feeling that popular (as opposed to academic) art history assumes that the public can only cope with one movement at a time. 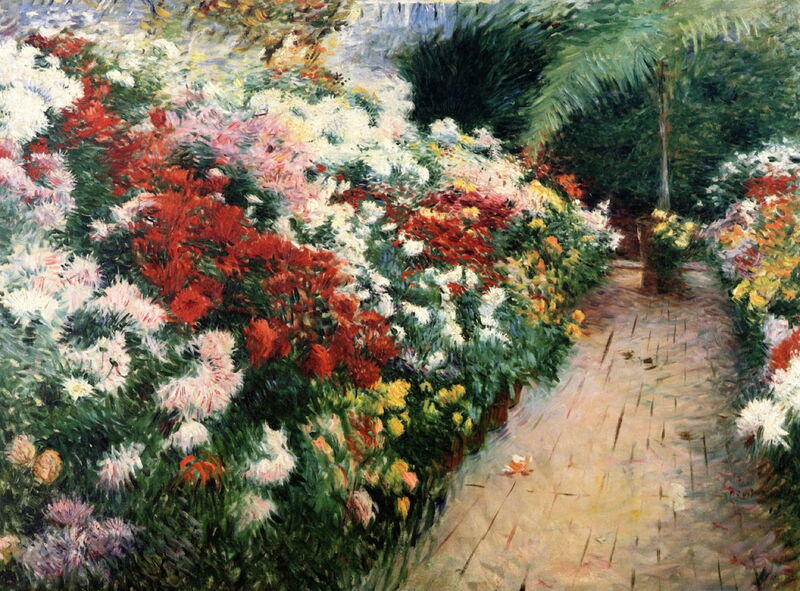 So the late 19th century is Impressionism, and anything else, like Moreau, symbolism, etc., just gets ignored. I greatly enjoy tasting from the richness of the many different styles, movements, and individuals. I think that they are all an important part of our cultural heritage. It helps a great deal, in fact. I had not even considered those ancillary aspects but you are quite right. We are not only at the mercy of museum curators but also of those who need to make generalizations and simplifications in order to fit the history of art into one text book and course. Unfair indeed.